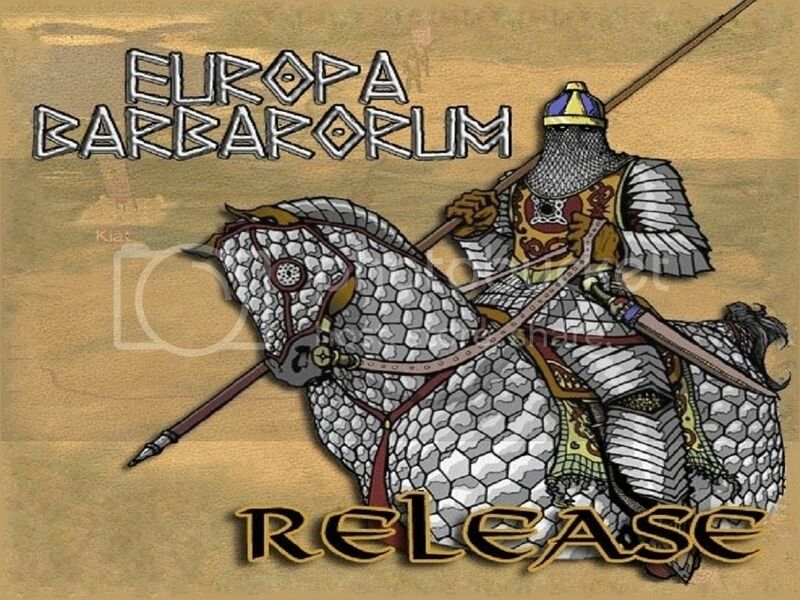 Thread: [Submods Compilation] Europa Barbarorum Release v4.1 for EB 2.01 by b0Gia. [Submods Compilation] Europa Barbarorum Release v5.2 for EB 2.01 by b0Gia. Welcome Europa Barbarorum fans. You may have seen several submods and modpacks, some planned, some made; some good, some lost, some buggy, some useless; and many small. One that will completely change the way you play and feel the game, that will upgrade your experience to a whole lot better. This modpack is the most completed and the closest to official EB II since i joined the team. It contains many submods that were around here in order not to lost them like EB I, and are compatible all each other. Update: New version v5.2 coming next. Also i have some extra ideas fo the future. I made vegetation and sounds optional because they are final so there is no need to download 80 mb every time i make an update to Mod pack. For the same reason loading screens are too because they are 65 mb. Also delete maps.rwm after you install Vegetation. Because of Epeiros and Epeirotai are spelling Apeiros and Apeirotai, when I saw them in the traits, and ancillaries I thought that I must change them. Apeiros means untrained in Greek and Apeirotes or Apeiroi the untrained ones so this is odd. So I changed them to original Epeiros and Epeirotai. Originally made for EB 1.2 by Konny. I thought it would be a good addition so I redesigned it to work for EB 2. All the credits go to Him for the original idea. Positive Character Traits Submod v3. This mod is designed to make generals easier to develop and have more positive character traits. Originally made by Goth. Updated by me to work for EB 2.01. Also fixed some bugs. All the credits go to Him for the original idea. Placement of additional Hellenistic Poleis Submod. 1. Added a Minor Hellenistic Polis to Chersonesos, Histria, Messana, Nikaia, Olbia, Rhegion, Babylon and Trapezous. 2. Added a Hellenistic Polis to Seleukeia,Halikarnassos. 3.Added a Hellenistic Metropolis to Pella, Taras, Rhodos, Antiocheia, Bactra. Originally made by QuintusSertorius. Modify by me to add the above Poleis. All the credits go to Him for the original idea. They're Greek generals wears in Egyptian and Eastern fashion. Originally made by TuCoT. Updated by me to work with EB 2.01 .All the credits go to Him for the original idea. Changes the watchtowers for villages for all factions. A fix for broken Bactria script. Credits to Seljuq Prince for the fix. So little info about this Submod. So if you are Seleucid and you want Elephants the best way is to conquer Bactra and later India or build Basilike Patris. Also added Indian armoured elephants. They are extremely rare. You can recruit them to India, Bactra with oligarchy government 1 and two. An updated EDU with all the new fixes. Credits to QuintusSertorius for his work. Originally made by imareaver. Updated by Gigantus to work with EB 2.01. I modify it to work with other Submods because they conflict. All the credits go to imareaver for the original idea and to Gigantus to modify it to work with EB 2.01. Added Victory Conditions maps for almost all factions. Some are from original Europa Barbarorum 1.2 team and other from Jirisys'. I redesigned them to work with Europa Barbarorum 2.01. All the credits go to them for the original idea and the maps. Because i don't know how to make new maps for all factions i used these ones. If you don't like the map for your faction go to data\world\maps\campaign\imperial_campaign and delete the map for your faction. There are for both sort and long campaigns. VC means the long and VCS the short. Changed the faction attitudes for the most factions for the better. Credits to Germanicu5 for probably the best BAI ever. My own music Submod with all legendary sounds from Rome Total War combined with Epiccaesarlol's work. Credits to TheRiddle2406 for his sound mod. Original created from Atraphoenix for EB 1.2. Redesigned and Expanded to work for EB 2.01 from me and MIKE GOLF. The focus of this was to adress some of the issues with the lighting and vegetation from the first release. Credits to alin for his work. I created 44 new loading screens for EB II. Some are from original EB 1.2 and all are great and fit to the era of the game. Now you can recruit again generals to join your cause. You are Aedui or Arverni you can recruit generals from all Celtic regions. You are Pritanoi you can recruit generals from all Briton regions. You are Boii you can recruit generals from all Celtic regions. You are Sweboz you can recruit generals from all Germanic regions. You are Lugia you can recruit generals from all Baltic regions. You are Getai you can recruit generals from all Dacian regions. You are Lusotannan you can recruit generals from Iberian regions. You are Arevaci you can recruit generals from Iberian regions. You are Rome you can recruit generals from all Italy regions. You are Carthage you can recruit generals from all Punic regions. You are Numidia you can recruit generals from all Numidian regions. You are Saba you can recruit generals from all Arabian regions. You are Nabatu you can recruit generals from all Arabian regions. You are Seleukid you can recruit generals from all Hellenistic regions. You are Makedonia you can recruit generals from all Hellenistic regions and Hellenic regions. You are Pergamon you can recruit generals from all Hellenistic regions. You are Ptolemaioi you can recruit generals from all Hellenistic regions. You are Epeiros you can recruit generals from all Hellenistic and Hellenic regions. You are Bosporan you can recruit generals from all Hellenic regions. You are Baktria you can recruit generals from all Hellenistic regions. You are Koinon hellenon you can recruit generals from all Hellenic regions. You are Hayasdan you can recruit generals from all Caucasus. You are Gandhara you can recruit generals from all Indian regions. You are Sauromatae you can recruit generals from all Sarmatian regions. You are Parthia you can recruit generals from all Daha regions. You are Saka you can recruit generals from all Saka regions. Now cumulative with new Official "HOTFIX - several correction to broken trait mechanics" 16/9. So you only need this Submod to have everything patched.You don't need to install the original Hotfix. 1) Backup the original files if you want just in case. The best solution is to backup the whole folder somewhere in your C: as EBII backup. I have tested all the sub mods and they are working and if one issue even appears I will release a hotfix as soon as possible. So if you don't backup them there is no problem. Re: [Submods Compilation] Europa Barbarorum Release v4.1 for EB 2.01 by b0Gia. Last edited by MIKE GOLF; 02-07-2015 at 20:49. Thanks MIKE i fixed it. Extract into you EBII folder. Re: [Submods Compilation] Europa Barbarorum Release v5.2 for EB 2.01 by b0Gia.